note from the school dietitian was handed to me by a young mother of a 7 year old boy. “Billy’s diet has come to our attention,” it read, “because he no longer selects milk in the cafeteria.” He had recently given up milk at my suggestion because it worsened his asthma and eczema. The note went on to conclude, “Milk is absolutely necessary for for protein and calcium!” This last sentence was heavily underlined. I quickly realized how concerned Billy’s mother was, because there was also a history of osteoporosis among several elderly members of her family. This dilemma is encountered most frequently by families who are trying to reduce saturated fat and animal proteins in their diets. They’ve read that both may increase the risk of heart disease and certain cancers, but worry about calcium balance and bone density if milk, the chief source of saturated fat for children, is discontinued. I often reassure concerned parents that some bowing of their child’s legs is normal up to the age of 3, and is not due to a calcium deficiency or rickets. Dental decay in early childhood, causes the same concern, but ironically it is partially due to the frequent bathing of the teeth with milk, rather than a calcium deficiency. Why is this paranoia so common among Americans? The milk-calcium-bone density myth has been created and perpetuated by the intense lobbying of the dairy industry throughout the lifetimes of most adults living today. Throughout kindergarten and grade school, most of the nutrition teaching aids were supplied by the American Dairy Council. As a result, most parents, teachers, doctors, lawyers, judges, and significantly, members of congress grew up with the not unbiased view that milk is a necessary and wholesome food for both children and adults. The council’s most effective campaign tool has been to link milk, calcium, and bone density. To further confuse the consumer, milk and infant formulas have been fortified with vitamin D, which is necessary for proper calcium absorption. It may also be obtained by eating sardines, herring, salmon, tuna, egg yolk, and fish oils. However, none of these are necessary, because it’s manufactured in adequate amounts by exposure to as little as 10-15 minutes of sunlight about three times a week. Rickets may be prevented in children getting no sunlight–such as the totally disabled, by a vitamin D supplement, if the parents do not wish to feed them fortified milk. This may explain why countries consuming the most milk also have the highest incidence of osteoporosis. Exceptions exist, but a common determining factor seems to be the high protein consumption in populations who require very high levels of calcium intake. For instance, the RDA of calcium in the United States is up to 1,200 mg daily. This is much higher than the World Health Organization’s recommendation of 500 mg. for children and 800 mg for adults. Areas of the world where dietary protein is very low have low national recommendations. In Thailand, for example, the recommended daily intake of calcium is only 400 mg. for all ages. Elderly South African Bantu women, who consume a very low protein diet (5O grams daily, compared with 91 grams for Americans) and only 450 mg. calcium daily, have no osteoporosis despite the calcium drain of nursing an average of 10 children. On the other hand, Eskimos, consuming a very high protein diet (250-400 grams) of fish, and a calcium intake of over 2,000 mg daily, have the highest rate of osteoporosis in the world! Now, let’s take a new look at milk and dairy products as a calcium source, regardless of their protein content. 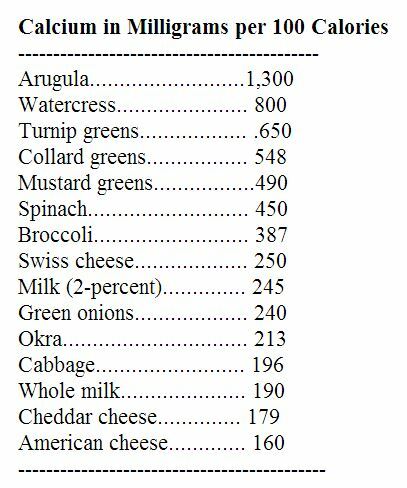 Calcium expressed as mg. per 100 calories instead of per gram show milk and cheese at the bottom of the list and green vegetables at the top (see chart). At first glance, one may conclude, “but I would have to eat so much more spinach or kale to get adequate calcium.” Not so, individuals on a plant-based diet generally eat as many total calories as meat and dairy-eaters. In other words, adequate amounts of vegetables are BETTER SOURCES OF CALCIUM THAN MILK AND CHEESE. Also, consider that a cup of broccoli contains about the same amount of calcium as a cup of milk. But wait! Haven’t we been told that many green vegetables contain oxalic acid, which reduces the absorption of their calcium. This too, has been exaggerated by the dairy lobby. A 1990 report in the American Journal of Clinical Nutrition concluded that greens such as broccoli and kale have high levels of calcium which is absorbed at least as well as that in milk. Excellent calcium balance on a non-dairy diet is easily attained because ALL vegetables and legumes contain calcium, and collectively it’s more than adequate. This calcium stays in the bones, unlike much of that from the high protein-containing dairy products. Now it begins to make sense. In cultures where the most protein is consumed, the calcium requirement for good bone density and protection against osteoporosis may be UNATTAINABLY high, without supplements — it’s a Catch-22. But for the majority of the world population, and among those consuming a plant-based diet in Western countries, calcium requirements for normal bone density are easily obtained without milk or other dairy products. Milk, it now seems clear, is not the solution to the malady of poor bone density. It may be a part of the problem, and you can have your calcium without the cow. Previous Previous post: Want to avoid dementia?